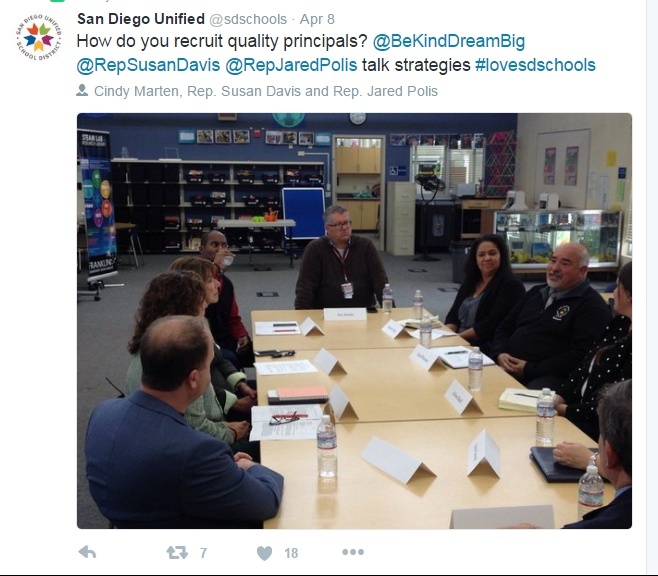 Even US Representative Susan Davis (CA) and US Representative Jared Polis (CO) Can’t Teach Incompetent SDUSD Supt. Marten How to Recruit a Quality Principal! Another Principal selection blunder by incompetent San Diego Unified School District Supt. Cindy Marten is going to cost taxpayers thousands of student dollars along with any remaining shred of trust by Lincoln and District Stakeholders. Since Marten was improperly promoted to Superintendent, there has been over a 60% Principal turnover…a shocking disruption to thousands of Teachers, Students and Families. and to their school site cultures. Adding to the dysfunction, many of the replacements have either no experience or a fraction of the credentials of the Principal they are replacing…a key Marten blunder characteristic. Lincoln High has been especially hard hit, highlighted by the Marten removal of highly qualified and credentialed Principal Esther Omogbehin through the unholy Cindy Marten/Marne Foster alliance a couple of years ago. The latest Marten Blunder at Lincoln just adds exponentially to her legacy of incompetence. According to District Deeds sources, the following sequence of events occurred in the latest Dictator Superintendent Cindy Marten Principal Selection disaster. As District Deeds outlined in “NEWS FLASH!!! SDUSD Supt. Cindy Marten Sinks to New Ethical Low in Lincoln High Principal Selection Scam!” last week, Supt. Marten ignored, demeaned and attempted to intimidate the community Stakeholders through her authoritarian appointment of a Principal candidate for Lincoln High School. After the offer was made by Marten, sources within the Normal Street Central office discovered that Marten neglected to properly screen the candidate and that there was a record in social media of numerous improper and offensive comments and statements. As she has done in the past numerous times, Marten attempted to cover up her blunder and commanded that the offensive posts be deleted without knowing that the Lincoln Community had already copied the posts. When confronted with the evidence she tried to delete, Marten’s cover up attempt was thwarted and she had to rescind the offer to her hand-picked Lincoln High Principal candidate. As a result of her Principal Selection Process scam, Marten has already wasted thousands of dollars in salaries and time of the Lincoln selection committee that could have been dedicated to the Students at Lincoln instead of feeding her dictatorial ego and operational incompetence. Lincoln High School is now starting the school year WITHOUT a permanent Principal and has to go through the selection process all over again…essentially DOUBLING the cost of the principal selection. To compound her blunder, Marten has decided to assign 3 interim Principals to “fill in” as Lincoln Principal simultaneously while the Principal Selection Process is restarted thereby TRIPLING the staffing expense for the Principal position…thousands of student dollars wasted! And the three interim “Principals” assigned? Two of the “fill ins” have never had a full time permanent position as a Principal, the third has only had Elementary Principal experience. I am sure that the three are dedicated professional educators and will do their best to help Lincoln High School. However, from a management assessment perspective, the problem is NOT with those interim Principals…it is with the incompetent Superintendent who had put them in the position to fail. This operational blunder by Marten triples the complexity and the Interim Principals, the Teachers, Staff and Students will have to work even harder to achieve a successful learning environment…and then do it all over again once a permanent Principal has been installed. The end result is a staffing disaster that could have been avoided by having a competent and wise Superintendent that actually listened to the Lincoln Community instead of acting like an insecure dictator. District Deeds and many of our readers are convinced that NO ONE can teach Supt. Cindy Marten good judgment and ethics…only firing her can do that! Wish to continue my support of your work which is very important! Persistence is a Virtue. Be virtuous! Boyer P. August, Ed. D., M. S.